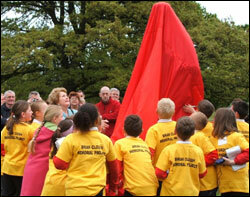 It was an emotional day as Middlesbrough's tribute to Brian Clough was unveiled (May 16th, 2007). 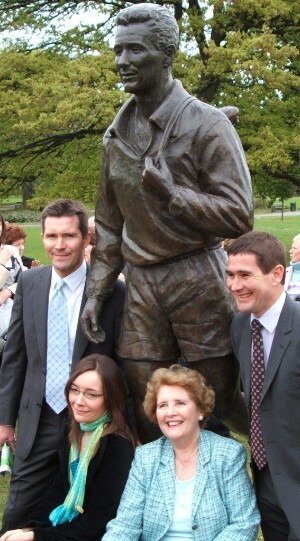 Cloughie's wife Barbara performed the unveiling of the statue in Albert Park, near his childhood home, with help from youngsters from his old school, Marton Grove. Cloughie used to walk through the park on his way to Middlesbrough's old football ground, Ayresome Park. Said Mrs Clough: "Brian and I spent many sunny days in this park, so it is really appropriate that it is here." "Wherever we went, Brian made sure everybody knew he was from Middlesbrough," said Mrs Clough. "He used to say, 'that's in Yorkshire, you know,' and then he would talk about the Yorkshire cricket team. That's the way he was. He was so proud of Middlesbrough." All generations of the Clough family attended the ceremony. His son Nigel said it was an emotional day for all the family. "It's lovely that my Dad's brothers and sisters are here to see the statue," he said. "Dad would have been very proud." Nigel is pictured below (right) with brother Simon, sister Elizabeth and Mrs Clough. 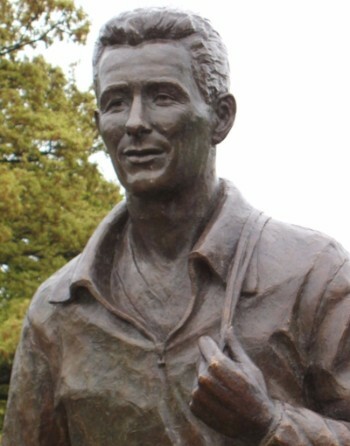 The bronze statue, costing £65,000, shows a 24-year-old Cloughie with his boots slung over his shoulder. It was paid for through a combination of donations, fund-raising events and the Heritage Lottery Fund. Mrs Clough told the gathering that Brian would have been very proud. "He would have been absolutely amazed at the very idea of a statue and he would have been so touched at the different ways you have raised the money. You have done him proud and I thank you from the bottom of my heart. I know the whole family feel the same way." Addressing the crowd which had gathered for the ceremony, Mrs Clough also said Brian would have loved to have managed the Boro: "I think if his success as a manager had happened here, that would have been his ideal. But life is not that perfect." 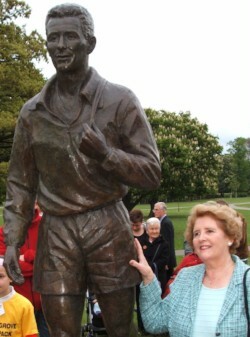 Cloughie's sister Doreen, who lives in Middlesbrough, said: "I think the statue is lovely. The ears are perfect and his nose is just right. The statue even has that twitch around the mouth which was just like Brian." 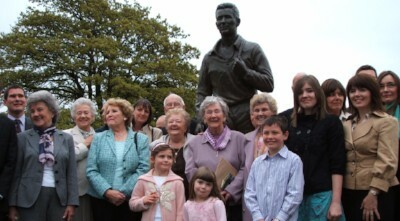 Members of the Clough family gathered around the statue for a photo, as one person in the crowd shouted: "What a team!" The chairman of the fund-raising committee, Cllr John McPartland, said: "The statue is in recognition of one of the greatest people to ever come from Middlesbrough. There is a deep feeling for Cloughie from the people in this town and they don't want him to be forgotten. "We didn't want our statue to be the one that Nottingham will have, which is an older Brian Clough as the manager. 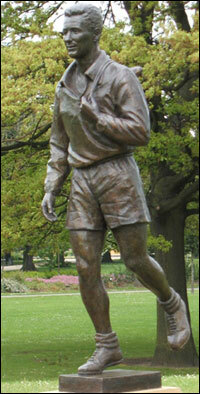 We wanted the young athletic Cloughie who would have walked through this park on his way to the matches at Ayresome." The statue was created by sculptor Vivien Mallock who said it had been one of her toughest assignments. 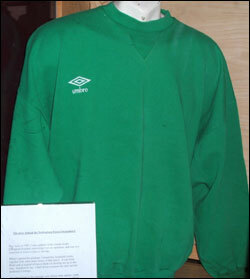 An exhibition at the nearby Dorman Museum included the original green sweatshirt Cloughie wore for his last league home match for Forest against Sheffield United. It was loaned to the exhibition by his sister Doreen. 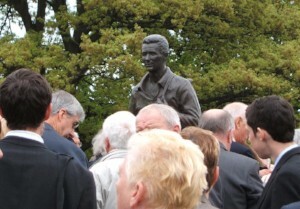 The lottery grant made not only a significant contribution to the cost of the statue, but also funded a series of educational projects including a Clough Trail leaflet, a teaching resource pack and the museum exhibition. 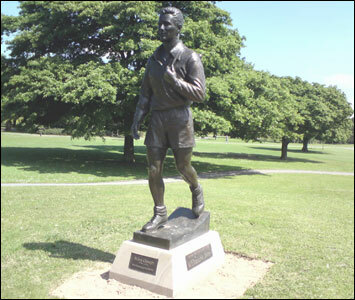 During 2008 a fatigue fracture was discovered in the statue's right leg, which mirrored the ligament injury which ended Cloughie's playing career. The sculpture was fenced-off for a while before being removed in March 2009 for repairs to be carried out, at a cost of around £20,000. The statue returned in June 2009 with extra support for the left leg. When the damage was originally discovered, Cloughie's sister, Doreen, said: "When the statue went up, we thought it would be there forever. It's strange that the damage is on the right leg, but I suppose the statue is more true to life." One possible cause considered by council officials was that the crack may have been due to children swinging on the leg. 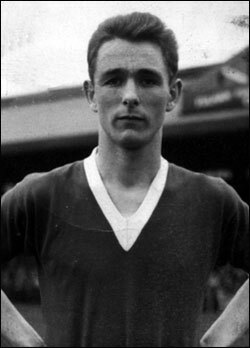 Councillor John McPartland, who chaired the fund-raising committee, said: "It's the same leg Cloughie injured in 1962. I think he might be telling us something from up in heaven." Repairs to the bronze statue took ten weeks and were carried out by a specialist firm in Surrey. Councillor John McPartland, chairman of the Brian Clough Statue Fundraising Committee, said he was pleased to see the sculpture back. "Brian's countless fans will be delighted that his statue has returned and that, thanks to some innovative work, is still as accessible as ever." The local council sought expert advice on how to repair the statue from Dr Paul Shelton, a metallurgist at Teesside University. Dr Shelton said: "My ideas were to either secure the leg with a pin which would be unsightly or to slightly change the statue so it looked as though he was coming down a step. "The statue has been restored by Laurence Flood of Bronze Restorations. Laurence agreed to my suggestion as did the statue's sculptor Vivien Mallock." Further repairs were required a number of years later.